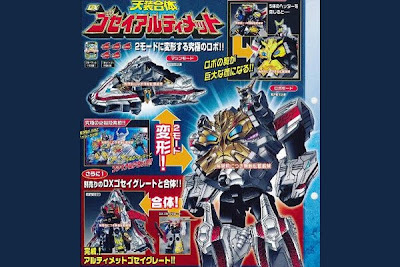 Toku Insider: GoseiUltimate Catalogue Pic! 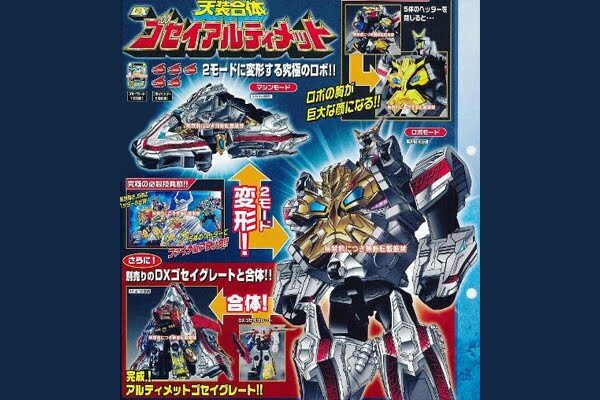 Massive, cool looking, and seems to have something to do with Master Head. The incorporation of the Miracle Headders really impresses me. I doubt this is our only release left, even though we haven't gotten info on anything else. We shall see. More toy pics (including Ozu stuff) should be out within the next couple of weeks. So are headers mecha or not? If they are then with guy we have to many to count anymore, rivaling gaos theoretical amount and all others actually shown. Else we only have a few so far. Headders are mecha, sure. But classifying them is a toughie. Technically, they'd fall somewhere between weapons and mecha I guess. I personally count each set of Brothers as a seperate mecha, since that's how they're released, and you'll never see one without the other.